What do you do when the weather outside is bad but you want to grill some food and are craving that smoky flavor? Or maybe you live in an apartment so even summer grilling outside is inconvenient. You can grill inside using an electric grill but you still won’t get smoked food. For that, you’ll need an indoor smoker that you can use either plugged in or over a stovetop. The best smokers for home use should be able to smoke a decent quantity of food evenly and should emit the minimum amount of smoke even while imparting a good flavor to the food. Most indoor smokers are to be used over a stovetop but we have one recommendation that is electric. A smoker is a large pan or wok shaped vessel that has a space right as the bottom for wood chips to burn, an optional tray on top of that to hold some liquid that will help cook your food, and a perforated tray or rack above to hold the food that needs to be smoked. A lid will cover the whole pan. When cooking a whole chicken, leg of ham, etc., you have to ensure that the whole thing is cooked through. Some smokers come with their own food thermometer to keep track, but if not, you should buy your own. The difference between regular outdoor smoking wood chips and stovetop smoker wood chips is that the former are usually larger because they are exposed to higher heat on the outdoor grill. When using an indoor smoker, you need smaller chips to start smoking at the lower temperatures. A table top smoker for indoor use should not produce as much smoke as an outdoor one, but you’ll still need to use an overhead vent or exhaust fan. If our indoor smoker top picks below don’t satisfy you, take a look at the offerings that Amazon has. Camerons is touted as the “original” indoor smoker, and for the price and performance, it has got to rate with the best in this class. The Camerons Smoker and Value Pack of wood chips can get you started with experimenting so that you get your smoked dish just right. As with all indoor smokers, they are more like roasters that add a smoke flavor from the smoldering wood chips that are burning at the bottom of the pan. It would be virtually impossible to smoke an entire ham shank, a whole turkey or several salmon fillets if you cover it with the included lid, but you can do a 3 lb chicken if you instead use aluminium foil to tent the smoker. It measures 11″ x 15″ x 3.5″ and will give your food a great smoky flavor. It is made of stainless steel and all of the parts are dishwasher safe. You’ll get 3 different types of wood chips, apple, alder and hickory to start with, and Camerons offers larger sizes and different varieties, so you’ll be able to pick and choose a flavor you love. It will work on virtually any cook top, but caution must be used on ceramics. If there is any over hang on the burner, you may damage the stove top. You can also use it in the oven but you’ll need to use more chips, as the lack of direct heat means slower burning. You may want to do the smoking part on the stove and then brown the food in the oven. There will be a little smoke from the appliance, so if you don’t want a room or home that smells like burned wood, which may not be too bad, always cook beneath a stove fan so you can vent any unwanted smoke to the outside. The Camerons brand started the genre, and if you want a decent stove top smoker that is versatile and easy to clean, you can’t go wrong here. Looking more like an outdoor barbeque grill than anything else, the Nordic Ware 365 Kettle Smoker is the most distinctive and unique looking smoker on this list. Made of durable ceramic over steel, the outside can be cleaned with a damp wipe. The inside is coated with non-stick material. It will cook on virtually any heat source, indoors or outdoors, and even comes with a thermometer on the outside of the unit, so you’ll always know exactly what the temperature is like inside. Once the required temperature is reached, you can adjust the vent that is placed on the outside of the domed cover. It is one of the larger units with a high dome, so you’ll be able to get a full sized chicken inside, with veggies on the side, which makes this a great family cooker. It is not dishwasher safe, so although the outside can be easily wiped down, the inside may have to be scrubbed in the sink to remove bits and pieces of food but this is easy enough because of the non-stick surface. The handles are uncoated steel, so when lifting or turning during cooking, you’ll need oven mitts or hot pads. It comes with two types of wood chips for you to try. The Nordic Ware stovetop smoker may be the best looking one on the list. The Max Burton Stove Top Smoker looks like a near clone of the Camerons unit, but it costs less and you don’t get wood chips with it. It is also stainless steel except for the rack and drip pan, which are non-stick coated. All parts are dishwasher safe, so cleaning is fairly easy. The main knock on this smoker is that only the required amount of chips should be used. A few more may turn your food and your kitchen into a smoky mess. This one is always best used beneath a stove fan vent or outside. Also, the handles are uncoated, so you’ll need hot pads or oven mitts when lifting. 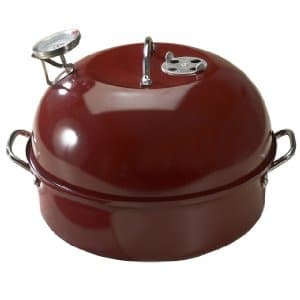 For the price, it will give a good account of itself and since it is the least expensive smoker here, if you want to find out what stove top smoked food is all about, this is the one to try. The most expensive smoker and the most versatile unit here, that’s what you’ll get with the Demeyere Resto Stovetop Smoker. It’s completely dishwasher safe and all stainless steel, the shape is a semi-round bowl type, so you can use it as a fryer, a wok, a mini-grill and even a steamer. However, there is a catch. Demeyere pioneered aluminum layered construction, and they use this process on their stainless steel smoker. This method allows unheard of even heat transfer throughout the cooking range of this product. However, on higher heats, like frying for instance, and unlike smoking food, which is done with lower temps over longer periods of time, there have been problems with melting the bottom or the seams coming apart. Granted, part of the reason to get a unit like this is because it is so versatile, but the reality is, the only way to guarantee that it will hold up for the long run is to primarily use it as a smoker first and foremost. Too high heat that damages the unit may void your warranty. All that being said, as far as quality about the way the food is smoked, this is probably the best home bbq smoker on the list. That layered construction allows perfect even temperatures, which makes perfect meals. No undercooking or overcooking, and as long as you smoke your food long enough, it will come out right every time. Wood chips will need to be purchased separately, but this beautifully polished stainless unit will look good anywhere it resides. If you’d prefer an indoor electric smoker oven rather than a stovetop one, look no further than the Oster 16-Quart Smoker Roaster Oven. It can be used as a regular turkey roaster if you don’t want to use your oven, and when you want that smoked flavor, just fill the included removable pockets with wood chips and insert them into the two opposite corners before starting the roasting process. In fact, this Oster model ranked as one of our top picks as an electric turkey roaster. However, it is recommended not to use this unit indoors for smoking but only for roasting, steaming or baking. The heat from the pan is enough to light the chips, so you don’t have to light them yourself.